Definitive Mexico stamps, during the very brief period from 1864 to 1866, bear witness to the establishment of a European-backed monarchy, giving birth to the short-lived "Mexican Empire". In 1858, Benito Juarez (1806-1872), of Zapotec descent, was elected as the President of Mexico. Though very popular with most of the Mexican population, his ethnic origin and his liberal views were not acceptable to the conservative Spanish aristocracy of Mexico. A group of Mexican "monarchists" appealed to the crowned heads of Europe for assistance, and in January 1862, King Napoleon III of France ordered the invasion of Mexico. Mexico City was taken in July 1863, and Ferdinand Maximilian Joseph of Austria was later designated as the Emperor of Mexico. The monarchy was never recognized as the legitimate government of Mexico by most of the international community. Under increasing international pressure, the French withdrew their troops in February 1867, and afterwards, the monarchy quickly collapsed. 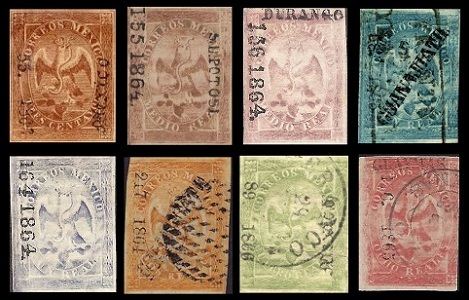 The eight definitive Mexico stamps shown above were issued beginning in 1864. The stamps are engraved on white paper, and they are imperforate. The common design features the Imperial Arms of Mexico (with the eagle wearing a crown). On these stamps, as well as later definitive stamp issues, the name of the country has been changed from "Mejico" to "Mexico". District name, consignment number, and "1864" in large figures. District name, consignment number, and "1864" in small figures. District name, consignment number, and "1865". District name, consignment number, and "1866". 03 C. (1864 - Normal Paper - Sc. #18) - Brown. 03 C. (1864 - Laid Paper - Sc. #18b) - Brown. 1/2 R. (1864 - Sc. #19) - Brown. 1/2 R. (1864 - Sc. #20) - Lilac, Gray, Gray Lilac. 01 R. (1864 - Sc. #21) - Blue. 01 R. (1864 - Sc. #22) - Ultramarine. 02 R. (1864 - Sc. #23) - Orange. 04 R. (1864 - Sc. #24) - Green. 04 R. (1864 - Sc. #25) - Red. Mint condition stamps without overprints, with only a couple rare exceptions, are remainders, and they have very little market value. As with earlier classical Mexican definitive stamps, reprints and forgeries are abundant. I found the nine Maximilian stamp images shown below at various locations on the internet. With this in mind, these Mexico stamp images may or may not be properly attributed. Thus, the markings on the stamps may not correlate exactly to the text descriptions below the images. The Maximilian issues, along with the various district overprints, are a very complex subject. I have provided a link to a Mexican website (now in English) that explains the district name, lot number, and date overprints of the lithographed and engraved printings of the Maximilian stamps described below. The stamp images on the index page show excellent examples of the periods after the value numerals in the design. 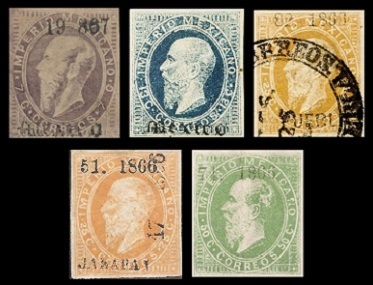 The five definitive Mexico stamps shown above were issued in 1866. They are lithographed on white paper, and they are imperforate. These lithographed printings have a "round period" after the value numerals. The common design features a left-facing portrait of Emperor Maximilian I. 07 C. (1866 - Sc. #26) - Lilac Gray, Deep Gray. 13 C. (1866 - Sc. #27) - Blue, Cobalt Blue. 25 C. (1866 - Sc. #28) - Buff. 25 C. (1866 - Sc. #29) - Orange, Red Orange, Red Brown, Brown. 50 C. (1866 - Sc. #30) - Green. The four Emperor Maximilian I definitive stamps shown above were also issued in 1866. They are engraved on white paper, and they are also imperforate. These engraved printings have a "square period" after the value numerals. 07 C. (1866 - Sc. #31) - Lilac. 13 C. (1866 - Sc. #32) - Blue. 25 C. (1866 - Sc. #33) - Orange Brown. 50 C. (1866 - Sc. #34) - Green. Mint condition Emperor Maximilian I stamps without overprints, with only a couple rare exceptions, are remainders, and they have very little market value. The 50 C. denomination engraved stamp shown above is a good example. In the 2016 Scott catalog, the mint stamp, with the overprint, catalogs $700.00. The mint stamp, without the overprint (shown above), catalogs $2.50! 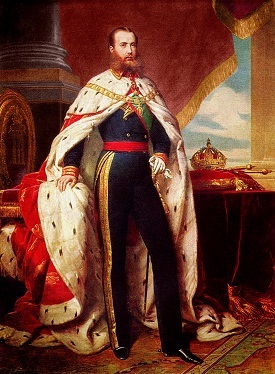 Ferdinand Maximilian Joseph of the House of Hapsburg (1832-1867), the younger brother of Emperor Franz Josef I of Austria, became the Emperor of Mexico on April 10, 1864. Emperor Maximilian I never really had a chance. The government of the Republic of Mexico had not been overthrown. It had simply fled into exile in Northern Mexico, where it would continue its fight against the monarchy. Having fought an 11 year war, earlier in the century, to gain their independence from Spain, most of the Mexican population would not tolerate being under the rule of a foreign monarch once again. The new emperor tried making some liberal political concessions to the Mexican population, in the hope of gaining their favor, but his efforts were in vain. Republican forces occupied Mexico City and captured the emperor on May 15, 1867. The 34 year-old Emperor Maximilian I was later sentenced to death, and he was executed by firing-squad on June 19, 1867, after a reign of only three years. His body was later returned to his family in Austria, and he is entombed in the Austrian Imperial Crypt in Vienna.